Starting up the Cadillac South Ridge Trail. September 27, 2015 marked a historic day for Philadelphia - Pope Francis held a mass to close the World Meeting of Families in town. The city undertook serious security measures including car-free perimeters, closing major highways, requiring event-specific public transit passes, and more. As special as the event was for the city, dealing with the restrictions and expected influx of visitors wasn't appealing, so a group of friends and I opted to escape to Acadia National Park for a long weekend of camping and hiking. Acadia National Park, located on beautiful Mount Desert Island off the coast of Maine, is home to 125 miles of hiking trails - perfect for a long weekend escape. On my first trip to Acadia in 2011, it was clear how "island of barren mountains" (Isles des Monts Desert) got its name. Though deciduous trees, coniferous trees, and numerous other vascular plants grow on the island, exposed rock is visible just about everywhere you look. It's some of the most unique terrain I've ever seen and makes for incredible, challenging hiking. One of the best things about hiking in Acadia is the fact that hikers are rewarded with incredible views and scenery without climbing very high. Cadillac Mountain, the tallest "peak" on Mount Desert Island, tops out at just over 1,500 feet. But that doesn't mean the hiking is easy. 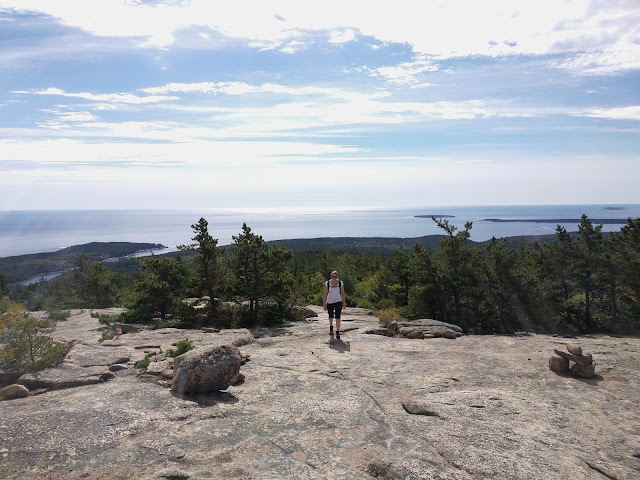 Many of the best hikes in Acadia start at sea level, require seriously sturdy shoes with good traction, and involve a ton of steep climbs and descents, including hand-over-hand scrambling. Though you can drive to the top of Cadillac Mountain via Park Loop Road, on our first day in the park, we opted to summit Cadillac Mountain on foot via Dorr Mountain. 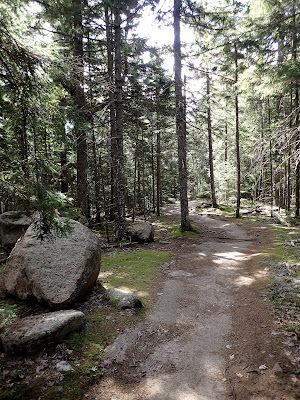 There are a number of different ways up Cadillac Mountain on foot, but given Blackwoods Campground was base camp for the weekend, my friends and I grabbed our map and started at the intersection of the Cadillac Mountain South Ridge Trail and Route 3. 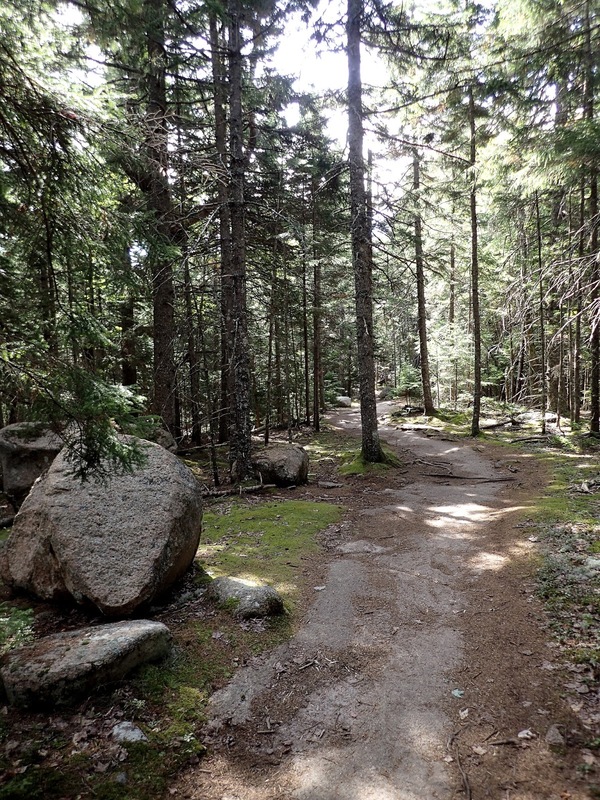 The trail climbs gradually over smooth rock patches, through dense stands of coniferous trees, and up strategically placed rock steps. We came to the intersection between the South Ridge Trail and a side trail to Eagles Crag just under one mile in and headed east in search of views. The trail to Eagles Crag rejoins the South Ridge Trail less than 1/2 mile later and the views are absolutely worth the side trip. Taking in the view from Eagle Crag. Not bad, Mother Nature, not bad. 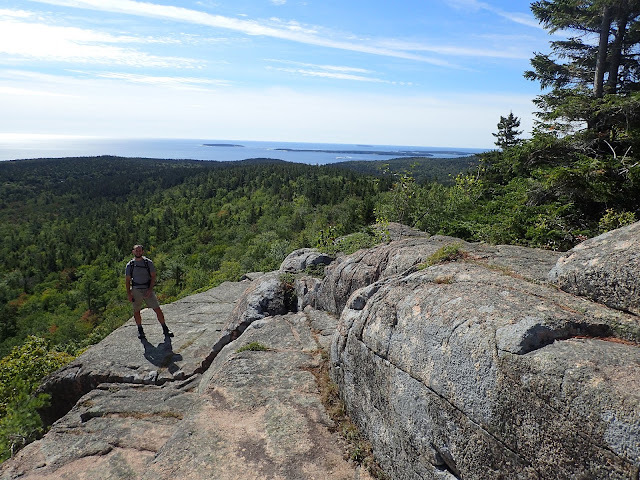 After our detour along the Eagle Crag Loop, we continued along the Cadillac Mountain South Ridge Trail until we crossed the Canon Brook Trail. 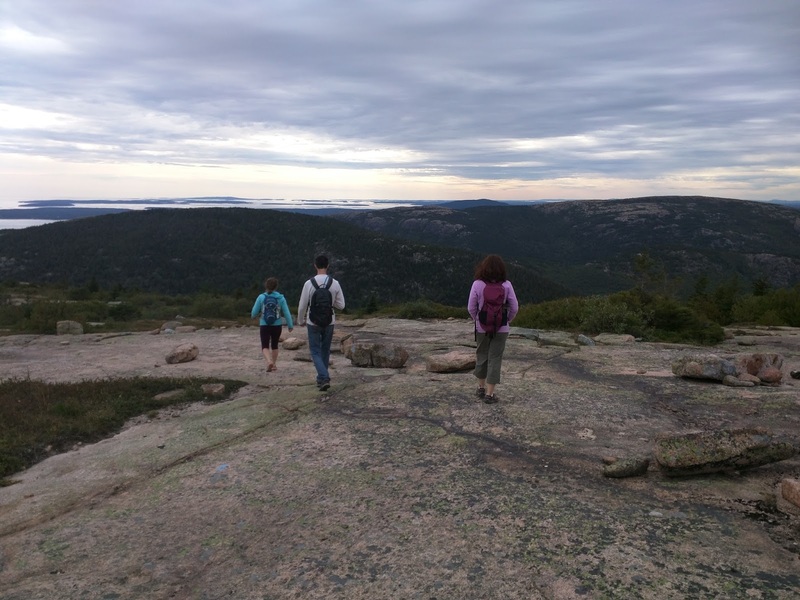 Heading west takes hikers down to one of Acadia's famous carriage roads while heading east gives hikers access to a number of other trails around and up Dorr Mountain. We chose to head up Dorr, figuring why not find the top of two of Acadia's peaks in one day? 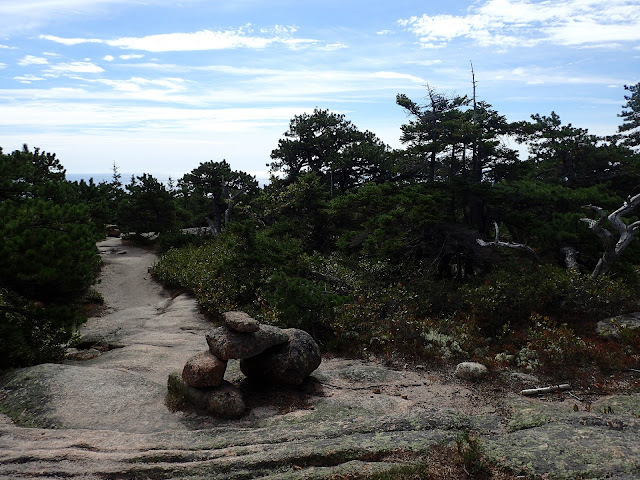 The Canon Brook Trail was clearly used less frequently than the Cadillac Mountain South Ridge Trail; it's narrower, steep, and dropped us down approximately 800 vertical feet in one mile to the Dorr Mountain South Ridge Trail. Rock hopping, climbing down boulders, and crisscrossing steep, flat exposed rock made for a challenging, but enjoyable descent. Wooded areas along the trail reminded me of home while the exposed rock was another testament to how Mount Desert Island got its name. The conclusion of our short lunch break meant starting down Dorr Mountain, then taking the Cadillac Dorr Trail up to the summit of Mount Desert Island's highest peak. We dropped approximately 500 vertical feet in less than 1/8 miles, crossed through an intersection with the Gorge Trail and A. Murray Young Trail, then started climbing again. Our hike up the Cadillac Dorr Trail was only 1/4 mile long, but we climbed almost 700 vertical feet. This meant more hand-over-hand scrambling, some rock hopping, and by the end, my legs were on fire. All trails in Acadia are blazed blue, but sometimes, the blazes are hard to spot. All cairns marking trails in Acadia looked like this, which made them easy to differentiate from cairns built by people trying to leave their mark on the island. Like New Hampshire's Mount Washington or Pennsylvania's Hawk Mountain, the best viewing spots from Cadillac's summit are reachable by vehicle. (The Island Explorer bus is highly recommended in-season, traffic is insane). As we crested the top of the mountain, I saw dozens of people lining the summit trails and was incredibly glad we'd chosen to take the hard way up. We'd gained almost 2,400 vertical feet over the course of the day and we'd earned both summits. After a quick stop in the gift shop at the top of Cadillac, we visited the true summit of the mountain, snapped photos of the USGS marker, and picked up the Cadillac West Face Trail to head down to Bubble Pond. Though most of us typically look forward to descents as a way to ease the burden in our legs, that wasn't an option on our route down Cadillac. The West Face Trail traverses steep, exposed flat rock patches, which got tough on the ankles, and we found ourselves doing a good bit of sitting and lowering ourselves down over vertical gaps in the trail. The terrain slowed our progress, but the challenges made the trail significantly more interesting. When we reached Bubble Pond, our plan was to hop on the Route 4 Loop Road Island Explorer bus at 4:15pm, which would take us directly back to the Blackwoods Campground. However, we discovered that shuttle times are limited after August 31st and our 4:15 Route 4 bus wasn't coming. Oops! Instead, we hopped on Route 5 into downtown Bar Harbor, grabbed a snack, walked around, and took the 6:05pm Route 3 bus back to the campground. It was an unplanned detour, but was great to close out a day of hiking with a bowl of clam chowder. If you're planning this hike, or one along the two summits we visited, take a look at our entire route here, and wear sturdy shoes with good traction. 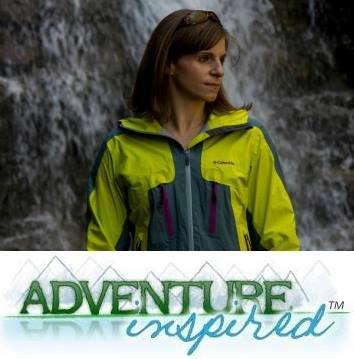 I'm testing the Ahnu Women's Montara boots and they held up just fine, but go without trail shoes or boots and you're in for a rough hike on some of the smooth rock sections. Take the Island Explorer bus as often as you can to get anywhere on the island, especially between major trails like the trails we chose. It's free, comes often, and you won't have to deal with the traffic jams Acadia is known for during the busy season. 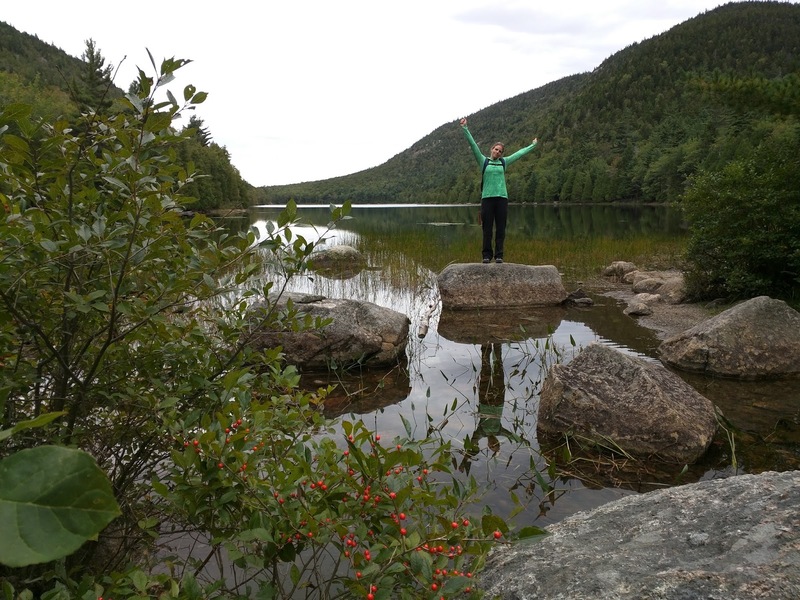 Have you been to Acadia National Park? Have you done this hike, or climbed either of these mountains? We'd love to hear from you in the comments! Also, be sure to pick up a map and a guidebook if you're hiking in Acadia.